Yes, yes, again your mad scientist/independent researcher ousted from Johns Hopkins AND Dartmouth has returned. 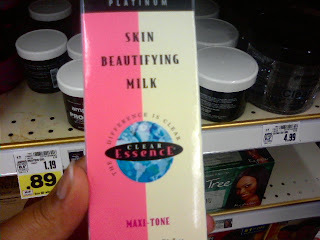 Over the weekend, since we had so much fun being horrified the last couple of times, we deliberately spent part of our day looking for skin lightening products. First, after a nice walk in the park, we tried a Walgreen's in a mostly upper class neighborhood, mostly white & mad hipster yo. 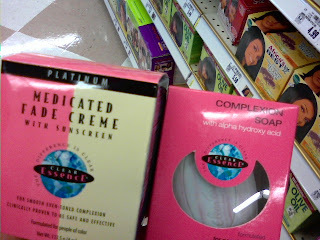 They had a teeny tiny black hair care products section but no skin bleach. Damn! So, we tried our own neighborhood Kroger. If you remember our first encounter with these products was in a Kroger in an upper middle class black neighborhood. Well my neighborhood is just about exactly the opposite--lower class, black majority, projects, gang neighborhood, etc etc. Look at the "Ultra Glow". Look at the name, first of all, then LOOK WHO'S ON THE COVER DAMNIT. 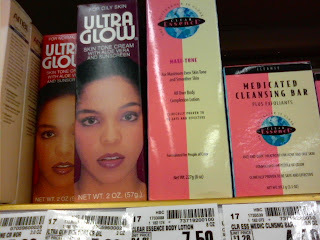 We found some of the same products in that first Kroger we went to but I don't think I got pictures of the Ultra Glow? 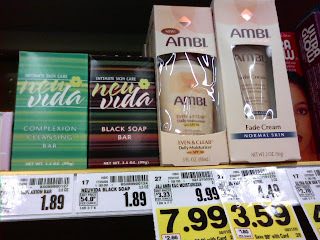 How nice, a black soap bar next to complexion soap (again). And fade cream. Yeah those are the prices. You'll notice all the nice, fancy names the products have. 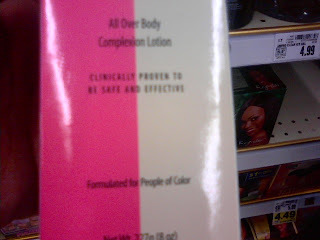 It says, "Formulated for People of Color". Hmmmmm.